American School has partnered with Rosetta Stone to offer ten online world language courses to its students. "We have students in all 50 states and in more than 65 countries around the world, but adding these Rosetta Stone courses makes us more internationally relevant than ever," American School President Gary R. Masterton said. "We are particularly happy to add Mandarin Chinese, English as a Second Language and German to our curriculum since students, parents and school officials have asked us to add those courses." In addition to those three courses, students can take Arabic, Dutch, French, Italian, Japanese, Portuguese and Spanish either as part of their American School diploma program or as individual courses to make up credit or enrich an existing homeschool program. More information may be found at http://www.americanschool.org/rosetta-stone and http://www.americanschool.org/courses/world-languages. American School has been a leader in distance education since 1897 and has helped more than three million students across the country and around the world earn their accredited high school diplomas. Students wishing to earn the American School’s diploma choose either General High School Program or College Preparatory Program, both of which contain 18 units of credit. A full, four-year diploma program costs $2100 and includes paper-based and/or online courses, all study materials, and access to the password-protected Online Student Center, where students and parents can view grades, access help sheets and homework web sites, and contact American School instructors and staff members. The American School also offers individual courses to students with an existing homeschool curriculum and to students who attend brick and mortar high schools. The latter group takes individual courses through the Independent Study Program, which thousands of schools use each year to help their students graduate on time. Individual courses typically cost between $150 and $300, and students who take individual courses receive the same Online Student Center benefits as those students who are working toward their American School diploma. 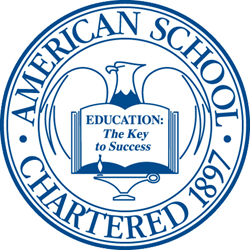 The American School is accredited by Ai (Accreditation International) and NCPSA (the National Council for Private School Accreditation) and is recognized by the State of Illinois as a non-public high school.